Wild Wadi Waterpark in Dubai features 30 rides and attractions themed around the tale of Juha from Arabian folklore, the park is home to a mixture of rides, slides and waves to cater for families and children of all ages. New to Wild Wadi Waterpark is Jumeirah Sceirah; two tandem slides 120 metres long and 32 metres high with heart-stopping speeds of 80 km/h. Guests ride side by side in a race to the finish. 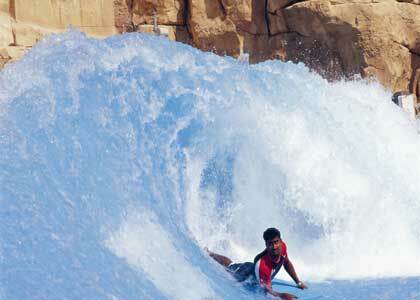 Thrill-seekers will also love Tantrum Alley and Burj Surj: two high speed tubing waterslides with a wow factor. The Wipeout and Riptide Flowriders offers the ultimate surfing experience with several tonnes of water that creates a realistic wave effect perfect for body-boarding or knee-boarding. For those that like something more relaxing, a gentle ride around Juha's journey, a 360 metre long lazy river, will appeal. This is just the tip of the iceberg at Wild Wadi Waterpark, there are plenty more slides and attractions to keep the whole family entertained all day long. When you need a break from the attractions, take some time out and laze by the pool on a private cabana, enjoy some tasty cuisine in one of the restaurants or hit the shops for some gifts and souvenirs. Guests of Madinat Jumeirah resorts, Jumeirah Beach Hotel and the Burj Al Arab receive unlimited FREE entry to Wild Wadi Waterpark and guests of Jumeirah Zabeel Saray receive one FREE pass.